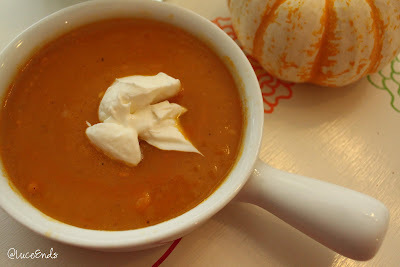 I've been planning to make soup with some squash and other veggies I picked up earlier this week. Yesterday the doctor told me that I need to cut sodium out of my diet for the sake of my blood pressure, so Tom and I decided we should look into low sodium broths at the grocery store on our way home. Interestingly, Campbells, Progresso, and a couple other "main" brands that carry low sodium options still have about 25% of a person's daily intake value in one cup! We found that Safeway's Organics brand has only 6%! Use any veggies you want, really. Below is what I happened to throw in. 1/4 adobo pepper from a can - These things are HOT. I tried using a whole one once, but we couldn't eat the soup. Now I open a can, cut a section off for the soup, and a freeze the rest for a later date. For some reason the freezing also makes them hotter. 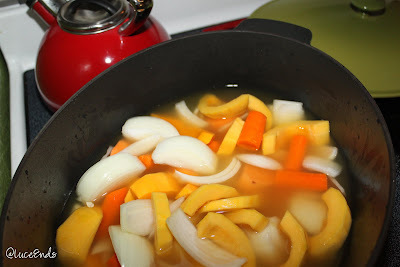 After all the peeling, washing, and slicing is done, place everything in a large pot with the chicken broth. You pretty much want it full of veggies, no extra room in the liquid. Boil for about 20 minutes. Use an immersion blender to puree everything. Boil lightly for a while longer to get the consistency you want. The longer you boil, the thicker it will get. Serving suggestions: add sour cream if it's too spicy for you, add salsa, add pesto if you want a greener flavor, or Tom's favorite: cilantro. Did I give you this recipe? Cause this is how usually make veggie soup in the winter - so good!